So you want to be a home barista but are concerned about the cost of an espresso machine? I’m here to tell you it’s not as expensive as you may think. In fact, it’s rather affordable to entertain your friends with café quality drinks in the comfort of your own home. Here’s the run down of the coffee equipment you will need. Let’s begin with the most expensive item on the list and what you’ll be using to make your coffee, the espresso machine, also known as a latte machine. Domestic espresso machines prices can vary from $50 all the way to $3000+. Yes that is a big price range. But usually the more you pay, the better machine you get, and the better coffee it makes. However the more expensive the machine does not necessarily mean the better. As there are some such as the Barista Express that balance coffee making ability and price. Today we’re going to work our way up from great entry level latte machines to some of their more expensive counterparts. Not everyone is willing to invest too much in a home latte machine, especially when they’re just starting out on their coffee making journey. The below are excellent starting points for people being introduced to the world of espresso. The De’Longhi is a small and compact espresso machine that allows the use of both coffee pods and ground coffee. This dual espresso making system is great for people who want to alternate between fresh coffee and coffee pods. It has dual thermostats that ensures the perfect temperature for espresso and comes equipped with a basic milk frother that is fit for entry-level baristas. The Mr. Coffee Espresso Maker is an entry level automatic latte machine. The unique difference for the Mr. Coffee is that is automates the milk steaming process rather than the espresso extraction process. This in turn takes out some of the challenges for people who are fans of a frothy cappuccino. Simply put in the milk, press a button and let the steamed milk come. The Gaggia Classic is widely recommended as the one of the best entry-level machines. The Classic comes equipped with a single boiler and a durable group and commercial grade exterior. One of the reasons the Classic is so popular is because of its small size compared to other espresso machines. It’s perfect for any bench top. For the price point and build quality it is no wonder why the Gaggia Classic is enjoyed as a great entry-level latte machine – it produces great espresso and silky foam in a shell that’s built to last. The following are for those willing to invest a bit more into their home barista set up. As you might expect the level of coffee these machines produce are of a higher quality both in the form of their espresso and milk texturing. Primarily this is due to their superior boiler systems that allow them to produce more pressure and steam. However mid-to-high end machines also have vastly superior build quality and a series of extra features. If you’re looking for one of the most user friendly espresso machines then the Breville Barista Express is the way to go. The Australian engineers behind this machine have created it with the home user in mind. It’s most striking feature is its inbuilt coffee grinder with adjustable settings. This is a big deal in the world of coffee making. Not only because of the convenience it creates by reducing your kitchen bench space, but also because of the money you will save for not having to buy a peripheral coffee grinder. Furthermore, it has an elegant design with semi-automatic settings that allow you to have full control of the entire coffee making process. This is the definitive mid-entry machine for the coffee enthusiast. The DeLonghi Magnifica is a hybrid that sits between the semi-automatic and super-automatic classes of latte machine. It’s semi-automatic as it contains an assisted steam wand. 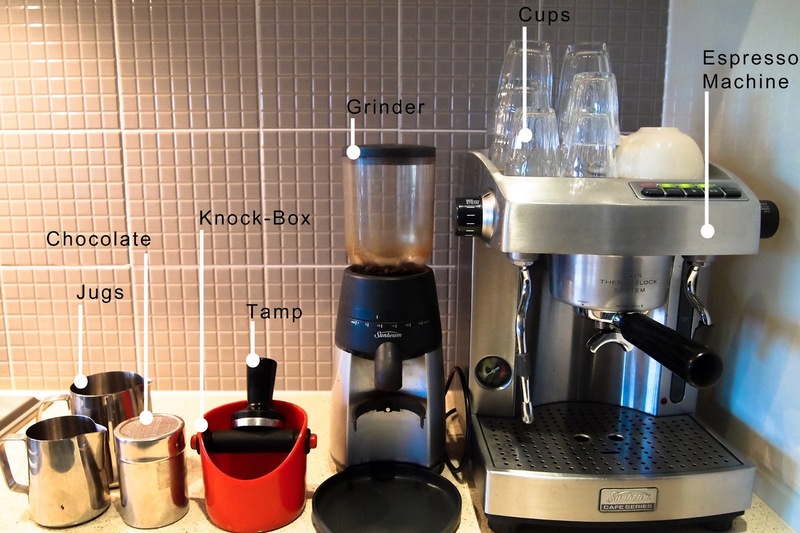 It’s super-automatic as it grinds, tamps and extracts espresso with a press of a button. The advantage of this system is that it allows for consistency where it counts – in the espresso extraction – and the assisted steam wand allows you to control how much foam you want for your coffee – more for a cappuccino, less for a latte. Furthermore, as this machine contains 2 boilers it allows for simultaneous milk steaming and espresso extraction. This machines allows you to create the silky milk found in specialty coffee houses while at the same time creating great espresso. The Magnifica is one of the best valued and popular in its class. The Espresseria is one of those machines that not only looks great but makes coffee equivalent to its elegant design. Like the Magnifica above it is a super automatic machine that auto grinds, tamps and extracts your coffee. While there is a manual steam wand that allows you to control how much steamed milk you want to produce. The Breville Dual Boiler Espresso Machine . This is probably the first machine that starts entering into the high-end price range. However, it is also one of the most recommended. This is because it matches the features and functions of its even more expensive counterparts while at the same time packing in modern features that the $2000-$3000 machines lack. The benefit of this latte machine is that it has a strong commercial design with a dual boiler system. This means one boiler is dedicated to steaming milk and another for pulling espresso shots. The benefit of two boilers is in its temperature control, sturdiness and reliability which means you won’t be needing a replacement machine any time soon. The stainless steal boilers within are electronic PID temperature controlled and displayed on a LCD screen, which allows for flavor experimentation by programming different temperatures for different coffee blends. But this machine takes the barista experience even further. It also offers customized low pressure pre-infusion, auto-start up functions, shot clock, and pressure gauges all within a designer enclosure. In closing, whichever machine you choose grab your biscotti, dunk it in your espresso and enjoy! Physical Inactivity in America Rises…. The U.S. is certainly second to none when it comes to consuming calories. The average American takes in 3,770 every day which is more calories than any other nation according to last year’s United Nations’ survey. So it’s probably not a big surprise that 83 million American’s (about 28% of the total population) recently reported they are “totally sedentary”, meaning never once participating in any of over 100 physical activities ranging from basketball to bowling in all of 2014. The 2015 Participation Report released this April was conducted by the Physical Activity Council (PAC) and based on more than 10,700 individuals and households that responded to questions about their physical activity in 2014. An “inactive” person was defined as anyone who did not participate in the over 100 sports and activities listed in the PAC survey that included walking, camping, hiking, yoga, bicycling and dozens more. The survey used to include extremely low exertion sports such as darts and billiards, but eliminated those in 2007. Since then, the level of the nation’s inactivity has increased 18% in just six years. Tom Cove, chief executive of the Sports and Fitness Industry Association and a member of the PAC noted the number of inactive Americans is the highest he has witnessed during the 24 years he’s been involved with the PAC survey. “While we can look at this number in a negative light, I would like to use it as a wake-up call…it’s time we put our time and resources into industry initiatives and national campaigns to increase physical activity,” Mr. Cove added. Further, PAC has found that physical education in the nation’s schools directly correlates to the fitness levels of individuals throughout life. A lessening emphasis on gym time for school kids over the years may be the main contributor to the rising inactivity level seen in adults today. How do you eat paleo on the road? Sure, eating healthy paleo meals can be easy if you’re at home all the time, but what about when you’re traveling? If you’re a road warrior, on vacation, or simply going on a cross-country road trip with friends, it can be tough to eat paleo. You don’t always have easy access to a grill, and you can’t always plan your meals in advance. It can be tough to eat healthy and stay paleo. But have no fear! You can still eat paleo on the road. Here’s how. First of all, if you’re traveling, cut yourself some slack. You probably won’t be 100% perfect (you might be, but it will be hard). Being on the road is tough, so don’t worry about being perfectly paleo. Aim to eat paleo 80% of the time. A missed meal or a poor snack choice here and there won’t kill you. You’re an adult, and the Food Police don’t exist. Just don’t let it become a habit. The most important thing while trying to eat paleo on the go is to be prepared. Set yourself up for success from the beginning and plan ahead. Know when and where your major pitfalls will come, so that you can plan to avoid them. There’s also a really cool app for the iPhone called PaleoGoGo that provides you with meal suggestions for over three hundred of the nation’s top chain restaurants. Now, onto the strategies for hitting that 80%. Find a local diner and enjoy some bacon and eggs. If you don’t want the typical bacon and eggs, order your favorite ingredients, throw them all into an omelet, and you’re good. If you’re offered pancakes, toast, or potatoes, substitute them out for the fruit cup or a banana instead. For your morning drink, skip the OJ, and have your coffee black. That will definitely wake you up. If you’re feeling dangerous, you can see if they’ll make it espresso for you. If you’re eating out, it’s probably easiest to choose your approach according to the types of restaurants you’re going to. The best advice is to find the most paleo friendly entree, and to either avoid the sides or to swap them out for vegetables (preferably) or fruit. Mexican food is typically very paleo friendly if you can avoid the tortillas and the chips. The best paleo Mexican meal out there is fajitas because you can simply eat the vegetables and meat off the tray, and give the tortillas to your friends. Delicious. Sushi is usually a pretty good choice too. While rice isn’t strictly paleo, there are definitely worse choices. Note that some sushi rice has trace amounts of sugar, so don’t stuff your face with it, but it’s acceptable in small amounts. As a side benefit, with sushi, you’re going to stock up on your Omega 3 with all that fresh seafood. If you want to go fully raw and avoid rice altogether, grab the sashimi. Seafood is paleo and, as long as you’re not somewhere in Kansas, it’s probably fresh too. Eat it up. If you’re entertaining clients, head to a steakhouse. Not only will you impress your clients, but you’ll also eat some pretty amazing food. Almost everything in steakhouses is paleo. That said, be careful with the mashed potatoes, gourmet mac and cheese, and the other sides they tend to bring out. Skip those sides, focus on the entrees, and you’ll have more than enough to keep you full. Or, if you’re feeling extra fancy, check out an all-you-can-eat Brazilian steakhouse and chow down some meat. You can do pretty well at these restaurants if you avoid the fries, chips, and buns. As well as typically serving higher quality meat sources than most places, these restaurants usually have decent vegetables as sides, and you can usually get a solid burger (with the bun on the side) or another solid meat choice with a side of veggies or fruit. Stay away from Italian. If that’s not an option, get the chicken or the meatballs, and try to have a killer Caesar salad. This kills me to say however, ignore the pasta. It’s not worth it. You can almost always substitute fries for a fresh salad. Take advantage of this option. If you’re going to be on the road or driving for hours, schedule in a little prep work, and bring a cooler – it’s about to get fresh up in here. Nuts – Almonds, walnuts, cashews, and more. Watch the fat content. Dark chocolate – Find stuff that’s 80% cacao or higher. Eat it in small amounts. Trail mix – Trail mix is a good pre-packaged option for a mostly-paleo snack. Watch out for the mixes which contain tons of sweets and/or peanuts (peanuts are not technically paleo). Beef jerky – Jerky can be a good snack as well, though it can get expensive if you choose it as you main snack item. Some brands also contain trace amounts of wheat and soy, so, if there’s any chance you have any allergies, be careful about overindulging in jerky. Store-bought jerky tends to have a high sugar content as well. Avocado is a personal favorite as it’s easy, portable, and tastes delicious. It’s sort of strange that we discount it, but you can go grocery shopping while on vacation. It’s true! While it might be hard to prepare a meal if you don’t have a full kitchen in your hotel room, you’ll probably be able to find some fresh or prepared food at a nearby grocery store. Some stores will even prepare a cut of meat for you in store. Or you can stop by the lunch buffet at a quality grocery store such as a Whole Foods. While fast food is sort of a “last resort”, believe it or not, it’s possible to observe a paleo eating regiment. If you start off with a base salad, it’s really hard to go wrong. The best part about this option is that most places offer salads these days. Even McDonald’s has them. Of course, salads don’t contain tons of calories, so feel free to toss on some chicken, avocado, steak, or any other paleo toppings before you dig in. If you do choose a salad, watch out for salad dressings that are full of HFCS and sugar. Ask for your salad without the dressing, or with the dressing on the side at the very least, and don’t drown your salad in the stuff. One of the easiest go-to paleo meals is simply choosing to eat a burger without the bun. Chik-fil-A, Five Guys, and other “nicer” fast food restaurants that tend to have better quality meat, and are the best choices here. Some (like Five Guys) will even have this as an option on the menu. Panera has a “secret” paleo menu. You can “hack” Subway to make it paleo-friendly. You can grab a burrito bowl at Chipotle, and be almost completely paleo. Whether you’re a road warrior, chronic traveler, or you’re just going on a trip, hopefully these strategies will help you stay paleo the next time you’re on the road. Slow cookers have been around for nearly 40 years. This simple appliance, first introduced as an electric bean cooker, has evolved into a versatile kitchen tool capable of cooking soups and stews, beans and meats, even breads and desserts — all with minimal preparation. Slow cookers make it possible for busy families to come home to a ready-made hot meal. They also use less electricity than an oven and give off far less heat, making them convenient even in the summer. It’s no wonder that slow cookers command such devotion from their owners. Look no further…..when taking into consideration the quality of food, “creature” features, durability and price the Cuisinart MSC-600 stands at the head of the line. This highly rated machine produces delicious, high quality food by cooking it at a slow, even pace. Many other brands tend to cook too hot, even when the temperature is set to low; this can result in food that is dry or overcooked. 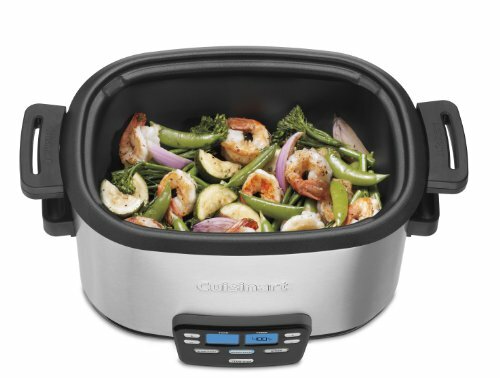 The Cuisinart takes its time, delivering a steady flow of heat to food and cooking it evenly. 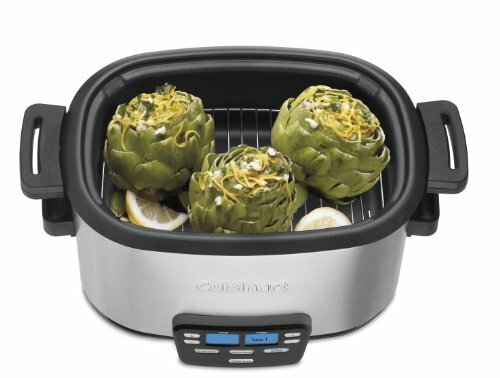 This model includes a 24-hour programmable cook time, hold-warm setting, space-saving retractable cord, and a rich looking brushed stainless steel housing. Clean-up of the Cuisinart’s dishwasher-safe glass lid and ceramic pot is also fast and easy. Yes, you will spend a few extra dollars on the Cuisinart however, you won’t regret it one bit; this is a high-quality slow cooker that definitely delivers the goods. 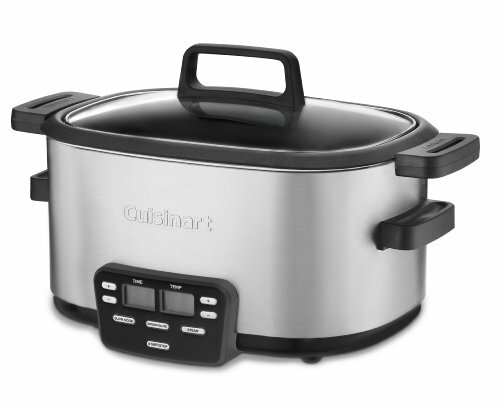 The Cuisinart MSC-600 is a 3-in-1 6-quart slow cooker, that is all you need for one-pot meals. It can brown and sauté, steam and slow cook all in the same pot for true one pot cooking. The Cuisinart comes in an oval 6-quart configuration that measures in at a whopping 9.5 x 12 x 19 inches so it takes up a lot of footprint and counter space. The Cuisinart comes with a glass lid so that you can check the meal without disturbing the cooking process. It comes with an additional steaming rack that allows food to be elevated for a better steaming position and a non-stick 6-quart cooking pot. It has three programmable cooking functions, which let you, sauté vegetables, and brown meats or slow cook your meals. The Cuisinart MSC-600 has a wide blue screen LCD display panel with press buttons for easy use and programming. You can adjust time and temperature to either minutes or hours and up to 400 degrees Fahrenheit. This is the first slow cooker that we could see that had this feature. 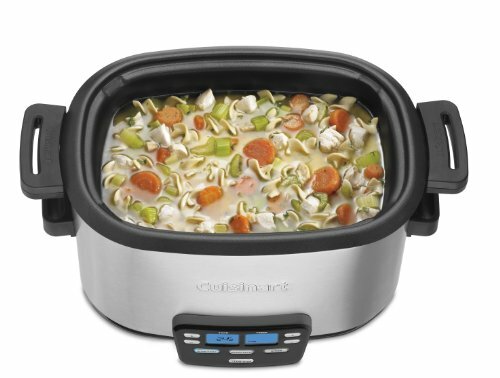 The Cuisinart has 3-in-1 functions so can be programmed to Steam, brown/sauté or slow cook. In order to steam, vegetables or fish and shrimps place the food on the elevated steaming rack and add water. To Brown/sauté use the as you would a skillet or sauté pan on the stove-top add the ingredients and brown/sauté at 350 degrees, but the selectable range is 150 to 400 degrees Fahrenheit. Slow cooking is done by setting the desired time and appropriate temperature and pressing start. The slow cooker has high, low and a simmer setting and is controlled by the twenty-four hour timer. Automatically once the cooking time has completed the cooker goes into keep warm mode for up to eight hours. The multi-cooking functionality on this Cuisinart is a stand out from the rest. The versatility is unmatchable by any of the competitors; none other can steam, brown\sauté and slow cook all in the same pot. Like all the other slow cookers that claim to be programmable the Cuisinart really isn’t for a number of reasons, one it has no clock so no ability to delay time, and secondly there is no facility to start a cooking program on high for a time and then switch to low. It is just one temperature setting and one time, that’s not really programming. This is truly a high-quality slow cooker that definitely delivers the goods. The Cuisinart MSC-600’s with a cost of $143 (best price Amazon) is worth every penny. This large slow cooker can easily accommodate food for a family of five to six, and the culinary results are top-notch. For the money, you also get a cooking rack, retractable cord, and 24-hour programmable time feature. Housed in a vessel of brushed stainless steel, this sharp-looking product represents sophisticated cooking quality at its very best. It is also ease to clean, as you only need to clean one pot and the lid despite doing three completely different functions. 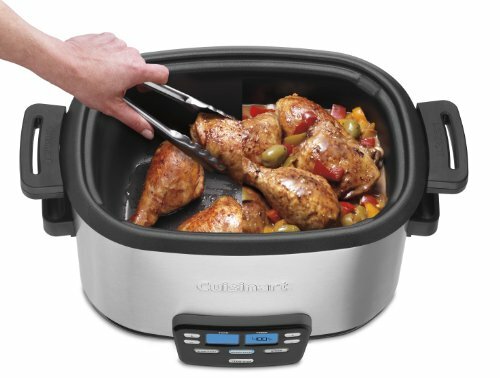 This slow cooker from Cuisinart is one of the outstanding products in the slow cooker range and will be a very good choice for most users. 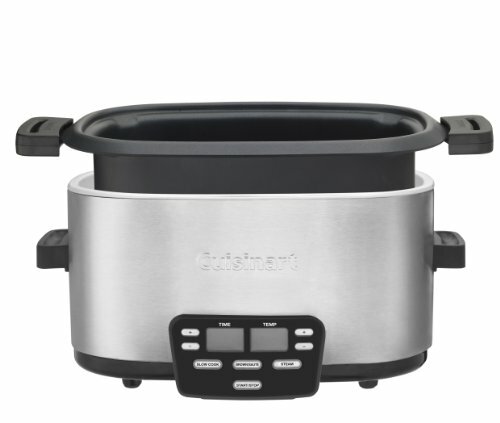 Investing in this durable slow cooker that will last you years (comes with Cuisinart 3-year limited warranty) will also save you money in the long run. Now here is that age old question that has been keeping many up all night…. Do I Need a Food Processor if I Have a Blender? Food processors are generally more versatile, since they have all different attachments that you can switch out to get different effects, but some people only need a blender, especially people living alone who aren’t making vegetable soup for 5 on a regular basis. Pick the one that works best for your kitchen and enjoy! There are literally hundreds (or maybe more) things you can do, make, or prepare with a food processor. It dices, it purees, it slices; it’s a multi-purpose tool! You’ll wonder how you ever lived without it. You can shred cabbage for making fermented sauerkraut, prepare pesto, grind nuts, grind meat, and you can even make your own coconut cream, almond butter, or even almond flour with this machine! You can squeak by without this but a blender is incredibly helpful for making smoothies, salad dressings, and pureed soups and they’re pretty cheap (you can get a basic model for $20-25). If you’re into soup, an immersion blender (stick blender) might be more your style; if you’re more on the smoothie side of the spectrum, a traditional blender is probably a more useful tool.f you make smoothies, coconut milk, or any kind of thin sauce, a blender is a must-have. You can make these with a stick blender or a regular blender, depending on your needs. Generally, if you have a food processor, you can probably get away with just owning a stick blender in order to save some space.